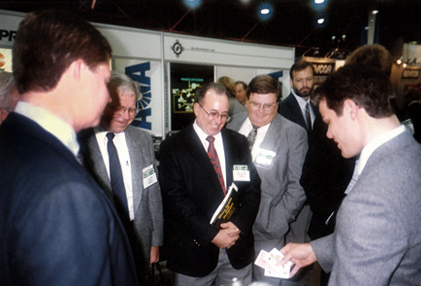 With a background in both entertainment and marketing, Tom Interval is uniquely qualified to draw high numbers of potential customers to your trade-show booth, or to entertain or train your employees at sales meetings and other company functions. Browse any of the sections below for more information. Would you like to significantly increase the number of potential customers who stop at your trade-show booth? Tom Interval is a highly skilled and experienced performer with a genuine talent for drawing large groups of people to your table and holding their attention. In addition to being a master magician, Interval has a BA in professional writing, minors in communications and management, and more than 12 years of experience in marketing communications. This enables him to skillfully incorporate your key sales points into his magic, leaving potential clients with a positive, lasting impression of your product or service and even more receptive to whatever message your executives or sales reps want to communicate. Interval's superb magic is also perfect for hospitality suites and pre-registration parties, adding a unique, personal touch that your potential and existing clients will remember for years to come. To schedule Interval to perform at your trade show, please contact him or visit the Bookings section of this site. Many great salespeople love magic because they're creative and enjoy activities involving social interaction. Well-performed magic is one of the most unique, creative, socially interactive forms of entertainment in existence. That said, hiring Tom Interval to entertain your sales team is a great way to thank them for another year of hard work and increased sales figures. Because magic is adaptable to different themes and settings, it's an extremely effective sales tool. Tom Interval will teach your salespeople how to incorporate key sales points into a memorable, mind-boggling magic presentation, enabling them to leave existing and potential customers with a positive, lasting impression of your products or services. To schedule Interval to perform at your sales meeting or to train your sales team, please contact him or visit the Bookings section of this site. Whether it's a holiday dinner or customer cocktail party, hiring Tom Interval to perform walk-around or stand-up magic at your company gathering is a great way to thank your employees or customers for another successful year. Interval's highly interactive, mind-boggling magic, combined with his engaging personality and quirky sense of humor, is something your guests will talk about for years to come. To schedule Interval to perform at your company event, please contact him or visit the Bookings section of this site.